I grew up right across the field from the Calvert County Fairgrounds. I remember like it was yesterday, one Saturday when I was 10 or 11 years old I heard a whole bunch of rucuss and saw a whole lot of black smoke rising high above the trees from the Fairgrounds. Being an absolute nut for anything with a set of wheels and a motor, I set out across the field as hard as I could go. You see, I knew there was a Tractor Pull that day, but the stock Farmall's and John Deere's barely creeping down the track never did interest me that much. When I reached the fence I realized this wasn't our regular Tractor Pull. Kay's Delight, a Super Stock International had just made a FULLPULL. I never knew anything like this even existed. There were Tractors with car engines? 4-wheel drive pick-ups that pulled? I was fasinated. My father's, just like his father's, main focus in life was building the family bussiness, which then consisted primarily of a good size Heating Oil company. To see him, you had to go to work, so to work I went. Next thing I knew, 35 years had gone by, I had close to 300 employees,I was 42 years old, and the only way my 2 year old son and my new born daughter were ever going to see me was to go to work. We made the decision to sell the Heating/Air Conditioning, HeatingOil and Propane divisions of our bussiness which makes whats left much more managable and hopefully would give me a chance to be a Dad. I quickly realized that the normal stuff like T-Ball just wasn't gonna work for me. If this Dad and family thing was going to work we had to find something we could all do together as a family, (and keep Dad out of trouble with the extra time he now found himself with). 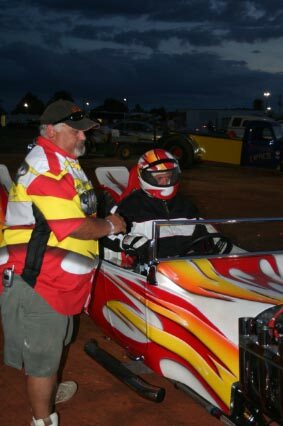 Over the years I went to many motorsports events. Dirt-track, Nascar, Drag racing etc. Nothing ever sparked my interest the way Pulling did. Every time I went, I was once again that little boy peering through the fence in amazement at Kay's Delight. My wife and I have been together nearly 20 years and she love's it to. Every Pull we went to she would always say, "I don't know why you won't get one". There was one Puller that I always admired, Mr. Ralph Wilson. I actually became very good friends with Ralph and his family over the years. He had built and pulled many different pulling vehicles over the years but in the late 90's he built a TWD T-Bucket called Renegade. This thing hooked like vel-cro and he was usually at or near the front of the pack. Ralph tried to get me to run it a couple of times over the years but I always made myself say no. I knew that if I ever did, I would become addicted and just didn't have the time for it. Our local Pull is in Laplata, Md. 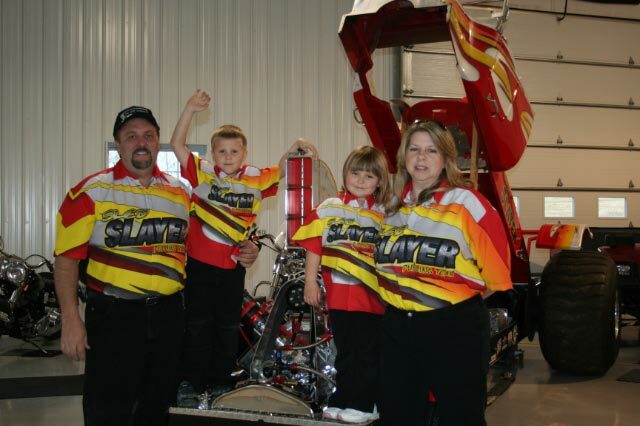 Connie and I decided to take the kids there for their first pull in July, 2006. They had a ball. Breanna was still a little young, but when I saw the look on Little Johnny's face it was like I was looking back at that little boy looking through the fence so many years ago. Ralph won that night. When we went over to congratulate him he told me that he had only been pulling once or twice a year at the local pulls and that he had decided to sell his truck. Well as far as I was concerned, it was sold before he finished saying it, but it needed to be a family decision. So we held a family meeting that was over before we got out of the parking lot. We were going PULLING. The next day I called my buddy Gilbert Walls, (a lifelong fellow motorhead), and asked him if he was interested in a hobbie. It took him about 2 seconds to say yes after I told him what I had in mind. I couldn't do it without him. Our first pull was at Manassas, Va. and believe it or not, WE WON! Man, what a night. I know it was beginners luck, but get this one, our 2nd win came at the same track, on the same night, exactly one year later. Think I'll ever forget Manassas?? We ran the truck the way it was the rest of the 2006 season. Over the winter, during the off-season, we polished, painted, and changed a few things to make the truck our own, went pulling, and have never looked back. It has turned out to be one of the best things we could have done for our family. Great people, great friends, great enviroment for the kids, great fun, great competition, and man what a ride for Daddy. Pulling has changed our lives. I would like to Sincerly Thank the entire Pulling community. The fellow Pullers and thier familys, the Pulling Organizations, the Promoters, and most importantly, the Fans, any one of which whom without, this experience would not be possible. Occupation: President of The Gott Company, a third generation family bussiness started by my grandfather in 1945. We are a wholesale distributor of motor fuels throughout Southern Maryland. We also own and operate a chain of Gas staion/Convinience stores and do Real Estate development. Bio: Johnny is 46 years old, married to wife, Connie and they have 2 children, Johnny (6) and Breanna (4). Johnny has only been pulling for 1 1/2 years. They won their first pull their first time out at Mannasas Va. Their 2nd win came at that very same pull, exactly 1 year later. Placed 9th out of 59 entries at Bowling Green their first time there (only 29th time they ever hooked).